The Fascinating Learning Factory,, a Colorado 501(c)(3), established in 2000, is delighted to act as Fiscal Sponsor for the most exciting production of 2019, The American HerStory Project. It is based on the best-selling book, Herstory: A Timeline of the Women Who Changed America, and will feature engaging web-based videos, podcasts and blogs. For millennia, women have been relegated to lesser positions in society, regardless of their abilities and influence. It’s finally time to change the conversation and give half the population their rightful place in history. These are the stories of the women from all walks of society that have invented, created or shown new ways of accomplishing to improve American life. You can help us tell these stories and open up the history books to the women who have helped make America grow and become the one unique country in the world where everyone, women and men alike can rise to the top and be celebrated for their achievements. Your donations will be 100% deductible and levels of donation will also include various gifts. A funny, high energy, content-rich series of lessons in civic participation. Examine amazing discoveries and solve mysteries. 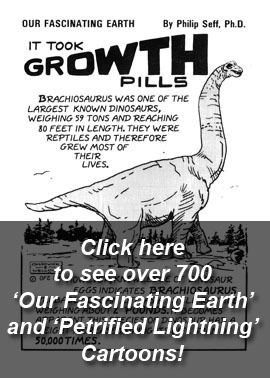 Click here to read the more than 300 fascinating and incredible stories; A kind of “Ripley’s Believe it or Not”® of natural science. Our kids require more than books and blackboards. While school districts can provide effective classrooms and curriculum, it falls to you and me to provide the additional tools vital in today's educational and technological environments. The Learning Factory has produced several educational programs that are in use all over the country. We must listen and learn, as well as teach. The Learning Factory integrates a wide variety of media into interactive technology environments like DVD media and the Internet. We know that learning is not a rote process, but a conversation between the learner and the teacher. We are constantly looking at new technologies to see how they can be used to enhance the educational experience, both in and out of the classroom. Sometimes you need a microphone, and sometimes you need a megaphone. While many of our programs are tailored for specific audiences, some are meant for the public at large. This is especially true of our many civics education programs for which we use broadcast and cable TV. The Learning Factory has multiple programs and documentaries that focus on civic education. These air nationwide, and are certainly the most expensive to produce. Please take a look at our programming proposals for television and help us get them 'on-the-air'!